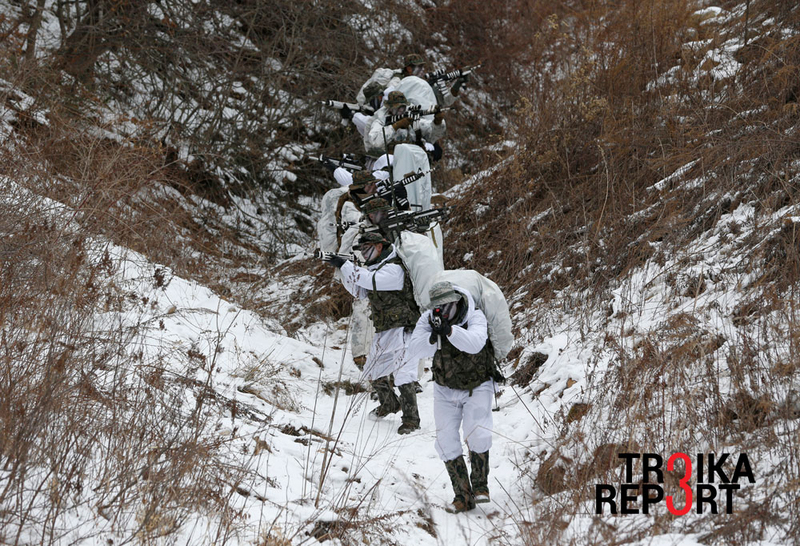 South Korean marines and U.S. Marines demonstrate in their reconnaissance mission during a combined military exercise in Pyeongchang. Russia delivered an uncharacteristically stern warning to North Korea, which has gone ballistic in recent weeks, with bellicose rhetoric and nuclear tests. Moscow losing patience with Pyongyang indicates that Kim Jong-un’s brinkmanship is threatening to disrupt the delicate balance in the Far East. The Russian Foreign Ministry has, in a rare display of discontent, issued a strongly-worded warning to North Korea describing its recent warmongering rhetoric in the wake of the nuclear and missile tests (in January and February 2016) as unacceptable. “We consider it to be absolutely impermissible to make public statements containing threats to deliver some ‘preventive nuclear strikes’ against opponents,” read the statement. While the statement also apportioned blame for fanning animosity on the United States and South Korea, for staging their largest ever joint military manoeuvres (which kicked off on March 7), the key message was in the warning to North Korea that its reckless sabre-rattling was providing a legal basis for use of military force against it. Moscow added a telling reminder that threats to attack or, the more so, “nuke” someone invoke the “right of a state to self-defence enshrined in the United Nations Charter.” Looking through records, this could be the harshest notice ever sent from Moscow to Pyongyang; a landmark event, indeed. Foreign policy analysts have taken due notice of the Russian statement. Despite the dubious assumption that Russia is a “friend” of North Korea, the main conclusion is correct: Moscow, as well as Beijing, is genuinely concerned over the surge in military activity by both sides on the Korean peninsula. Why? Professor Georgy Toloraya, director of the Centre of Russian Strategy in Asia at the Russian Academy of Sciences, spoke to RIR. Could it be also some flirting with the United States, given our ongoing cooperation on the Syrian track? All this huffing and puffing by Kim Jong-un – could it be targeted at a domestic audience? Is it part of the appeasement of the top brass? “Definitely, it has also the aim of propping up influence with the military and popularity with the population. However, I would hardly call it ‘appeasement’ because the generals are scared stiff by the recent purges and would hardly dare to challenge the supreme authority of the heir of the House of Kim,” Toloraya said. Can China rein in the strongman of Pyongyang? Beijing has even more reason to be worried. North Korea's unabashed refusal to abide by the norms of international behaviour is a thorn in its side. The recent nuclear and missile tests provide a solid pretext for the United States to deploy a high-altitude missile defence system in South Korea. Beijing has already voiced its opposition to this move, regarding it as a direct security threat. While some laugh off North Korean leader Kim Jong-un’s threats to “annihilate” adversaries using nuclear-armed missiles, there is a nagging suspicion that there are some grounds to believe he has the capability of doing this. But dangerously toying with nuclear weapons does not amount only to empty blackmail: It is the recipe for an explosive cocktail of instability and conflict – a conflict in the close vicinity of China, which has maintained a privileged relationship with all the three Kims. The billion-renminbi question is whether Beijing has the strings attached to control Kim Jong-un, who has recently acquired a disturbing habit of killing off his most senior military leaders to a quell possible dissent among the single most influential community. Is Moscow running out of patience? Raising the stakes in the ongoing confrontation between the two Koreas is detrimental to Russia’s interests. The last thing Moscow would like to see is an extended “arc of instability” stretching all the way up to the Korean peninsula. Secondly, Kim’s shenanigans deal a blow to Russia’s policy of a so-called “pivot to Asia,” focused largely on a gradual surge in the volume and quality of economic and trade interaction with its partners in eastern Asia. Moscow has taken due notice of Seoul’s decision to toughen its own unilateral sanctions against Pyongyang, which include among other measures, a ban on vessels entering South Korean waters within six months of visiting the North. The ban effectively puts on hold the Rajin-Khasan project, which would deliver Russian coal to the South through the North Korean port city of Rajin. Russia has nothing to gain but stands to lose much should the latent hostilities on the Korean peninsula persist. The deployment of more sophisticated weaponry by the U.S. government in response to North Korea’s irresponsible behaviour would keep South Korea hostage to the American military presence and limit its room for manoeuvre in goodwill diplomacy towards its northern brethren. It would also set further barriers to resumption of the six-nation negotiations (between the two Koreas, the U.S., China, Japan, and Russia) that collapsed in 2008 amid rather gloomy prospects of positive engagement with the reclusive Pyongyang regime and its unpredictable leadership. The high level of security concern over North Korea’s recent erratic behaviour has seen an emergency meeting called on March 11. At Russian Foreign Minister Sergei Lavrov’s invitation, his Chinese counterpart Wang Yi will visit Moscow to discuss conflict resolution in Syria and, at the top of the agenda, the North Korean quagmire. The opinion of the writer may not necessarily reflect the position of RIR or its staff.